Over the years, our family has had mixed success in growing a garden, but for the most part (and as a general rule), plants flourish when you take care of them. However, from time to time, we end up with seeds that start growing on their own, originating from many possible sources: old plants from the previous year, bird droppings, the wind . . . who knows. These unplanned plants, often called "volunteers" in the garden community, are generally unwanted, and I usually just yank them out of the ground. This year, one such plant sprouted in my onion patch, and I was very tempted to pull it out along with a bunch of other weeds. However, I hesitated, thinking of giving the plant a chance to grow. On more days than one, I stared at the plant, wondering where its sprawling leaves and vines would take it. "What could come from such plant," I grumbled, thinking that the area of the garden could be used much better for other purposes. Please understand that I didn't want to waste my time and water on some no good plant just taking up space. As the summer passed, the unknown plant kept growing and growing, expanding itself into the onions, on to the lawn, and up a trellis supporting other vegetables. I also spotted a strange melon-like fruit growing on the ground. It didn't quite look like a cantaloupe or honeydew melon, but it seemed to be of that family. Then, it suddenly ripened. We hauled the melon into the kitchen, cut it open, and saw a seemingly bland-looking fruit. Not quite the rich-looking orange of sweet cantaloupe, but when we bit into it, we were amazed out how an ordinary, unwanted plant could turn into scrumptious treat. 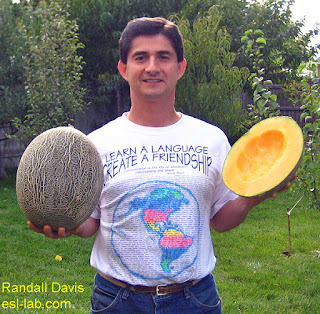 Later on in the season, two more huge fruits ripened on the vine as seen in the picture, weight about 12 pounds (5.5 kilos) each. So the next time you think something isn't worth the effort . . . that something is simply worthless . . . give it a little time, patience, and care, and you might be surprised what it turns into at the end of the harvest. So the next time you think something isn't worth the effort . . . that something is simply worthless . . . give it a little time, patience, and care, and you might be surprised what it turns into at the end of the harvest. Perhaps, that is the same with raising kids: don't count them out without the right nurturing patience that they need. Never give up! keep in mind that a garden ought to be a fun place for everybody.So, however does one organize kids within the garden? no matter you are doing, kids can continually be kids, and quite justly thus.